Your garage door needs to be regularly serviced, and summer is the best time to carry out many of the odd jobs that need doing. Our technicians are always ready to help you out, no matter the weather, but we know it’s a lot more pleasant to work on your garage door in warm sunshine than during a winter chill. Here are a few simple DIY tasks to take care of during the warmer weather. When winter sets in, you’ll be glad these things are already taken care of. Over time all doors get dirty. Dirt and dust will build up on your door’s smart exterior finish, making it look duller and less attractive. Each summer, we recommend spending some time cleaning up your door - it usually only takes an hour or two to do, and believe us, it makes a big difference. For metal and plastic doors, simply take a bucket of soapy water and a soft cloth out with you. With a little scrubbing you’ll find a year’s worth of grime coming off quite easily. If your door is made from real wood, a simple rub down with a cloth might not be enough. Wood needs to be protected from the elements, and the sealant used to do this should be regularly replaced. You’ll need to sand the door down first of all, before cleaning off any dust and applying sealant to every surface. It’s usually a good idea to apply at least two coats, depending on the sealant you use, so be prepared to spend several hours working on your door. Put some music on and get some friends to help – make it fun! All the moving parts of a garage door require lubrication in order to keep them operating smoothly, but old lubricant can become a problem. If it picks up dirt and dust, excess lubricant can prevent the door from working properly by becoming sticky and gummy. In addition to this, many parts of your door will pick up grime over months of continuous use. Take some degreaser (such as WD-40) and a cloth, and work through all the parts of your garage door to ensure they’re properly cleaned. Remember, degreaser is not a lubricant - you’ll need to apply proper silicone or white lithium grease afterwards! Further questions? 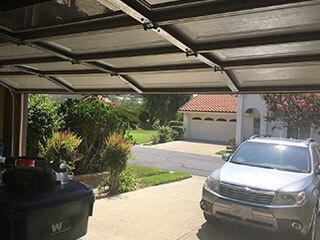 Just get in touch with our team at Garage Door Repair Santee, we'll be glad to talk to you.